Treatment. Kills head lice & eggs fast. Takes one 15 minute treatment. Dimeticone 4%. Treats up to 2x heads. Easy to apply. Skin friendly. No nasty odour. Contains no pesticides. With penetrol to boost egg kill. Mumsnet rated. Allergy certified. 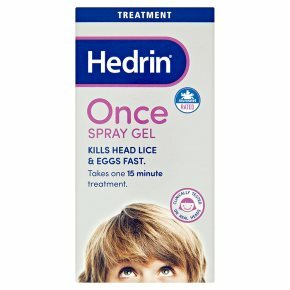 Clinically tested on real heads.Deal with every phase of head lice, with Hedrin: Treatment Hedrin®Once Spray Gel eliminates head lice and their eggs. It is not a chemical poison but works physically smothering the lice. It also contains Penetrol®which helps the product to penetrate louse eggs in order to kill them. Hedrin®Once Spray Gel has been shown to work with only once application buta further check should be carried out one week after application to make sure that no lice or eggs have managed to escaped the coating. If any live lice are discovered then the treatment can be re-applied. The gel can safely be used as often as required without lice developing resistance. PRECAUTIONS:<br>Hedrin�Once Liquid Gel is slippery. Baths, shower cubicles, etc., may become slippery when using or washing the hair. Take care. Wash any residues away with detergent and warm water.<br>Formulated with non-volatile ingredients, however, observe normal safety precautions and always keep hair away from naked flames.<br>Do not use if you are sensitive to any of the ingredients.<br>If a skin rash or other signs of allergy occur, stop use. Wash skin with soap and water and seek medical advice.<br>Do not apply to broken skin.<br>Do not use on children under 6 months.<br>Avoid contact with the eyes.<br>If accidentally introduced into the eyes, flush with plenty of water. If irritation persists, seek medical advice.<br>If accidentally swallowed consult a doctor as soon as possible. Take the pack with you to show which product you have swallowed.<br>Do not use after the expiry date shown on the pack.<br><br>KEEP OUT OF SIGHT AND REACH OF CHILDREN.<br>FOR EXTERNAL USE ONLY ON THE HAIR AND SCALP.